Our 'How to Stage an Opera' series offers different perspectives on the practicalities of staging an opera, from the initial research through to the final performance. Here we look at how the reception of Gounod’s opera has influenced the director’s approach. Charles-François Gounod’s Faust is a masterclass in operatic dramatic structure. It was collectively the greatest work of Gounod and his librettists Michel Carré and Jules Barbier – the duo that made a name for themselves adapting literary masterpieces for opera in Roméo et Juliette, Hamlet and Les Contes d’Hoffmann. But Faust was the first and the greatest. From Goethe’s epic Enlightenment verse-drama they and Gounod sculpted a work that complies with the conventions of French grand opera but has a dramatic immediacy the three would never better. The opera was embraced by the public from its premiere in 1859, and by the start of the 20th century had become the most internationally popular opera that had ever been. But hand in hand with the opera’s popularity there grew an increasing disparagement of Gounod’s version of the Faust myth, specifically the alleged trivialization of Goethe’s play. Richard Wagner was among the first to deride what he termed ‘a repellent, sugary-vulgar patchwork… wedded to the music of a second-rate talent’. By the early 20th century Faust, a victim of its own ubiquity, had become the prime operatic cliché. It was used by authors such as Edith Wharton and Hergé to encapsulate the perceived peculiarities not only of the operatic idiom itself but also the supposed social milieu of its audience. In the second half of the 20th century the opera disappeared from the repertory, dismissed as kitsch. As late as the 1992 edition of The New Grove Dictionary of Opera it was described as a work ‘too much of its time to transcend the age in which it was written’. This heritage of scorn provides modern directors with both a challenge and an opportunity. Gounod’s score, with its catchy tunes and show-stopping arias, and the proficiency of the libretto’s structure, ensure that audiences will have a good time almost regardless of the production. But opera is at its greatest when staging and music exalt the senses together. Modern directors have an opportunity to present the work in a way that forces audiences to re-evaluate it, a chance to guide them away from the kneejerk historical response and to discover latent qualities that may never have been seen before. 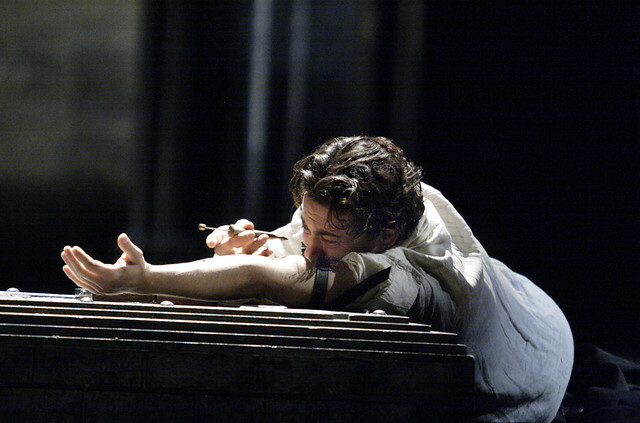 David McVicar’s 2004 production for The Royal Opera latches onto the opera's period sense that so offends some of its critics. He discards Gounod and Goethe’s medieval setting (based on the supposed real Dr Faustus) and instead sets the opera in the latter half of the 19th century, the time of the opera's ascent to fame and infamy. He finds a new story to tell, where Faust becomes a stand-in for Gounod, tormented by the conflicting desires for earthly pleasures and the simplicity of holy life that rent the composer’s life. The music, governed by the dance forms of Gounod’s era, becomes McVicar’s accomplice. The set is dominated by a theatre box on one side and an organ loft on the other – ever-present visual icons that loom over the action. The rustic village dance becomes a seedy show in the Cabaret d’Enfer; the team of doughty soldiers are pawns in the brutal Franco-Prussian War; the peasant maiden Marguerite is now Manet’s barmaid, pure but jaded; Méphistophélès is a figure of theatricality, preening himself in plush red velvet, inducting Faust first into the childish fun of dressing up, then seduction, and eventually guiding him into the abuse of absinthe and morphine. 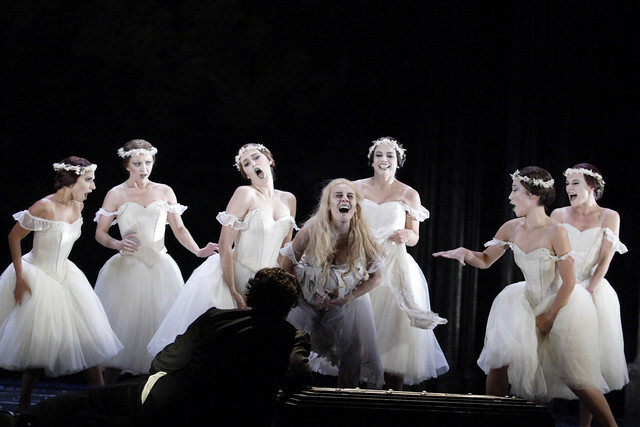 McVicar’s production retains the sense of spectacle that was a part of the opera’s initial success, employing specific references to the forms and technologies of the time – the flashing lights of the Cabaret d’Enfer, the grotesque Giselle-like Walpurgisnacht ballet. But more importantly, he introduces a troubling undercurrent that compels us to question the moral assumptions of Gounod’s time – for example, that the abhorrent abuse Marguerite suffers could be considered straightfoward entertainment. 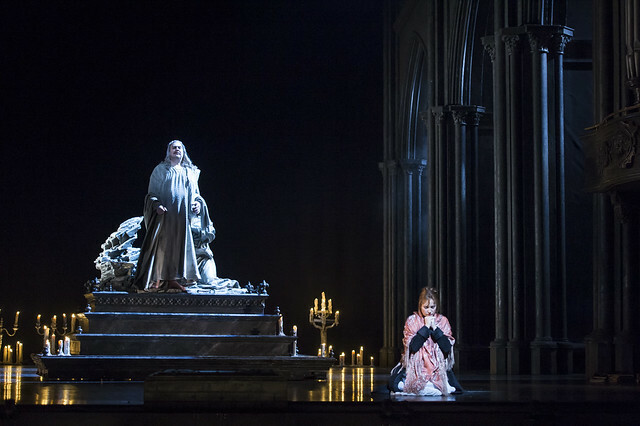 McVicar’s production of Faust is an example of how a director’s vision can diverge from the composer’s intentions while remaining true to the spirit of the work. Follow the next in our series to explore why Jonathan Kent’s production of Tosca follows Puccini’s original setting in Rome, 1800. Your closing sentence says "...Tosca follows Verdi’s original setting in Rome, 1800...." I presume you meant to say Puccini's original setting. Gosh, what an error – many thanks for pointing out. Corrected now.